Did you know that today is national Chicken Soup for the Soul Day? Dr. Marty Becker is a veterinarian who is a regular contributor to vetstreet.com, ABC's "Good Morning America" and the nationally syndicated "Dr. Oz Show." 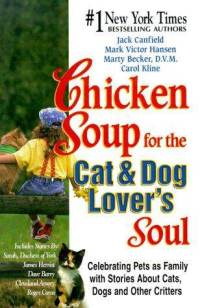 He's also written several books, including three in the "Chicken Soup" series, specifically about pets. Our mom interviewed him for Animal Planet a few years ago. Since Ryker cameos in the interview (um, mom? we think that's called nepotism...? ), we thought this would be a fun video to share today. Omc, Ryker was ADORABLE! Was he a kitten there or just a small kitty? He had just turned a year old! Oh how sweet were you. We just saw that you were one. Mega cute. Have a lovely Monday. Oh wow! Ryker did such an amazing job in the video! And that's so true about the bed bit. MOL. Poor Mommy wakes up with a sore hip from not moving because she has Cosmo on her left, Ling on her right and Tutu right between her legs. Ah...the joys of pet ownership. Maxwell: Yup. Mom's back is sore because we boyz had her pinned down between us for half the night! Wow! Ryker got a credit. How pawsome. We think pets are very impawtant too ! I could use some chicken soup right now. oh NOES! Is you sick??? We bet Moshe Moshi's on kitteh duty for you though! Have you been on a show on Animal Planet Ryker ??!! Way to go Ryker!!! Hmmmmmm, is it soup yet? MOL! We think Unca ryker did a pawesome job! He was our age when that was taped! Paws up to you and Ryker! We love the last part too! Wow--your Mom is famous, huh?? I think you have way cooler Humans than me. But then, the Human might say your Humans have way cooler cats so I'll just stop talking now, MOL! PS: The "poetic license" was pretending I had thumbs, ha ha meow! OMC Mom is squeeing so loud....Ryker was such a cute patootie!!! I LOVE Ryker's star turn! The vet guy is pretty cool too... although I could have told you all the stuff he said! Ryker was such a pretty kitty! He looked like he would rather play than be interviewed. 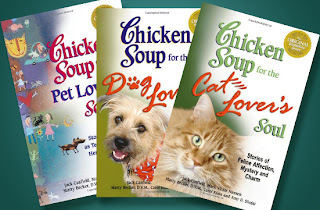 Our mom has several of the Chicken Soup animals books. They are addicting. What a great video! Thanks for sharing it with us and Happy Chicken Soup day! Ryker, you look good on video, you should make movies!